I feel like I should explain my idea of the perfect pizza. Not that I feel the need to validate my opinions, but at least give you an idea of why I’m so hard on pizza joints. We all have a pizza joint we love. Mine is in Oak Lawn, IL. A few years ago, I had never heard of the place. In fact, it was a few months after J and I started dating that she even brought me to her family’s favorite place. 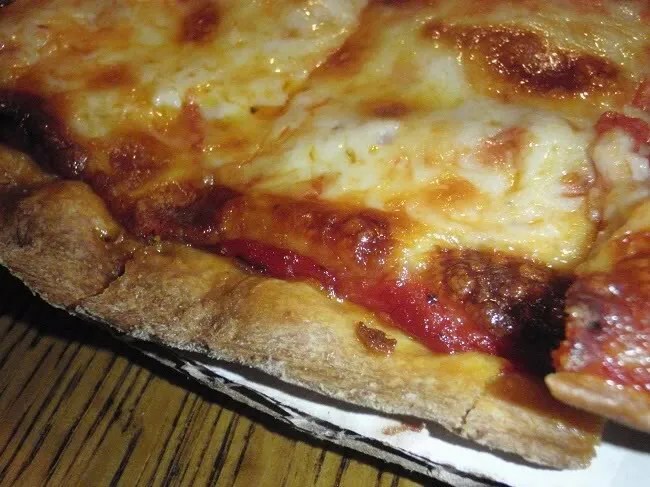 I blogged about Palermo’s 95th on Mid-Michigan Dining, but thought I’d bring the issue up again here so the new set of readers can understand why it seems like I don’t like most pizzas. The thing is, it’s not that I don’t like them. It’s just that they just don’t come close to the pizza that I compare everything to. 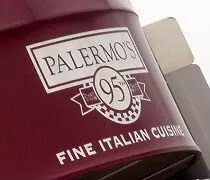 Palermo’s 95th is near the intersectino of 95th Street and Cicero Avenue in the southside Chicago suburb of Oak Lawn. It’s not just a pizza joint. It’s actually a pretty fancy Italian restaurant that happens to do an incredible pizza. There is a formal dining room with white table cloth service, but there’s also a carry-out window in the back. Parking is pretty awful. There is a lot directly behind the building, but it’s almost always full. You’re lucky if you find a spot. There’s a huge parking lot directly across the street, but don’t even think about parking there. The owner of that building will tow. Even though 98% of the lot is empty, he does not take kindly to Palermo’s customers taking up his spots. The building fronts a very busy Cicero Avenue so there’s no street parking. They do offer complimentary valet parking which isn’t a bad idea if you’re not familiar with the area. Most of the time, we just do carry-out or delivery. I’ve eaten inside the restaurant twice. The first time was the first time I had ever had Palermo’s pizza. The other time was our wedding rehearsal dinner. We turned a lot of people on to Palermo’s that night and I still get comments about just how good it was. On our most recent trip home, J called her mom as we were passing Paw Paw and asked if she’d have a pizza waiting. It worked out almost perfectly. We beat the pizza by about three minutes. J’s mom ordered an XL cheese pizza so we could all eat. The pizza is so good, even a plain cheese pizza is something I crave. My favorite combination though is a pizza with Italian beef and hot giardinara. It combines my two favorite things. Pizza and Italian beef. It’s a combination you won’t find anywhere else in the country. J’s parents turned me on to that particular pizza and I, in turn, have turned others on to it. The thing that makes pizza on the southside of Chicago so special is the way they are cooked. We always ask for our pizzas well done. That means the cheese comes out with a golden brown cheese and a dark, crunchy crust. To me, this is the perfect pizza. To outsiders, it’s burnt. If you read reviews on Yelp, you can always figure out who are the regulars and who are the non-southsiders. There are only a few pizzerias that do this kind of pizza. Vito and Nick’s is the more famous one, but Palermo’s does it better. If the pizza comes out a little darker than you’re used to, you know it’s done right. It’s the only way I want to eat piza now and why you hear me complain so much about chewy, doughy crusts. Palermo’s pizza has a cracker thin, crunchy, flaky crust with a dusting of cornmeal on the bottom, but the sauce is the star. The sauce is a ladled on pretty thick and it’s very sweet. I’ve played around at home trying to replicate it and I come the closest with a combination of carrots, honey, and brown sugar. Not your normal ingredients in a pizza sauce, but Palermo’s is so different. I don’t know for sure if that’s what they use, but I know that combination gets as close as I’ve been able to come. Palermo’s 95th is one pizza that I’m alright with paying a higher price. The extra large pizza starts at $20 before you start adding toppings, but it’s worth it. I’ve never had a pizza anywhere that tasted like Palermo’s 95th and I don’t think I ever will. J told me before I ever had my first taste of the joint that it will ruin me forever on pizza. She was right. Wow! I grew up on this pizza! I’m from Oak Lawn and Palermo’s defines pizza for me, even had my high school graduation party there. The Spinach and Tomato pizza is my favorite, perfect complement to the sauce. Glad you like it! It does for me to and that’s why I get so many people upset when I review pizza joints. Nothing compares to Palermo’s and I know that going in…but it’s so hard to enjoy pizza anywhere else..we keep looking hoping to find something close but never can. You’re spot on with the pizza. You gotta love the dark, thin, crispy crust. Good stuff. Another place that Pamela and I will have to take you to is Pizza Plus/Miratello’s for those of you living South of Oak Lawn. Sauce wise, they are almost a dead ringer for Palermo’s sauce… they revamped it a few years back and obviously had some inspiration when coming up with the new recipe. They have an original crust much like Palermo’s thick crust which we like better than the thin or deep dish at Pizza Plus. We’ll have to try it out sometime… maybe if we all get together at Anne and Mike’s we can order from their location in Frankfort. Palermo’s Hands Down Best Pizza, Southside Chicago. Grew up over 30 years enjoying every offering from 63rd to Tinley Park. I was born at 64th and Hamlin, and enjoyed pizza on 63rd Palermo’s for years. My grandparents still live there and the pizza is still just as great as ever. I grew up in Oak Lawn, 10 yrs. Palermo’s on 95th is a little different, but in every way just as good. The Calderone brothers of the original founders had split apart, and no longer claim affiliation, but they each had inherited the secret recipe to the sauce that makes the pizza so famous. 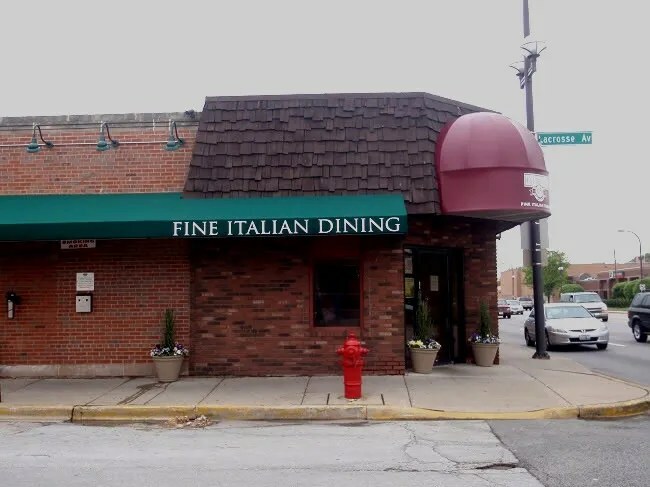 In orland Park, the most recent Palermo’s instituted a connection with 63rd st. Restuarant and claims the “all original” recipe without any connection with 95th’s establishment. Go to this one in Oak Lawn and they will deny any affiliation with either restuarant. This is most likely the result of the bad blood between the brothers, even though each of them can lay claim to a world-class pizza recipe. When it comes down to just that, try as you may to duplicate the flavor of that sauce you love so much in your home kitchen and ultimately you fail every time. It is really one-of-a kind. In a recent conversation with a head cook (Orland Location) I was told that just like it was 30 years ago when a batch of sauce is prepared everyone working is forced to leave or move to the back corner of the restuarant while the preparer locks everybody out to combine the ingredients discreetly with secret instructions. Nothing is offered to clue anybody in on what is used or what procedure is followed. To this day it just might be the ultimate secret to their success. I remember by the way how Aurelio’s failed so miserably after trying to open up and compete with the Palermo’s in Orland right in the same plaza (approx. 143rd st and Wolf rd). They closed shop after maybe one year. In my own quest to imitate the sauce, I have discovered a couple of crucial ingredients not yet mentioned on any thread. They consist of powdered sugar, lemon juice, vanilla extract, balsalmic vinegar, olive oil, and sea salt. Try just a little bit of each (only teaspoons at a time) and ramp-up each ingredient to your liking as you deem fit. Always use tomato puree or crushed and add paste to thicken. Basil and Rosemary is neccessary to sweeten the base. Simmering the sauce for a little bit then refrigerating the mix for min. 8 hrs works best when time permits. Good luck to you all, I have found that even when you perfect the taste you want in the sauce something else usually falls short such as the crust or cheese topping. But if you were able to make it all come together as perfect as Palermo’s well then you’d be living on Easy Street with your own business! Cheers to all you pizza lovers out there and Die-Hard Palermo’s fans. 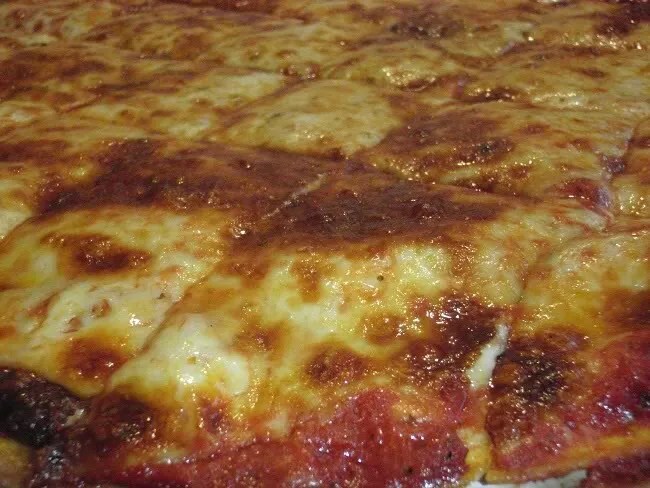 We share in common the best-kept secret in the world of Chicago’s Pizza Fanatics!